We started this walk from Kleine Scheidegg having visited Jungfraujoch (“Top of Europe”) in the morning. 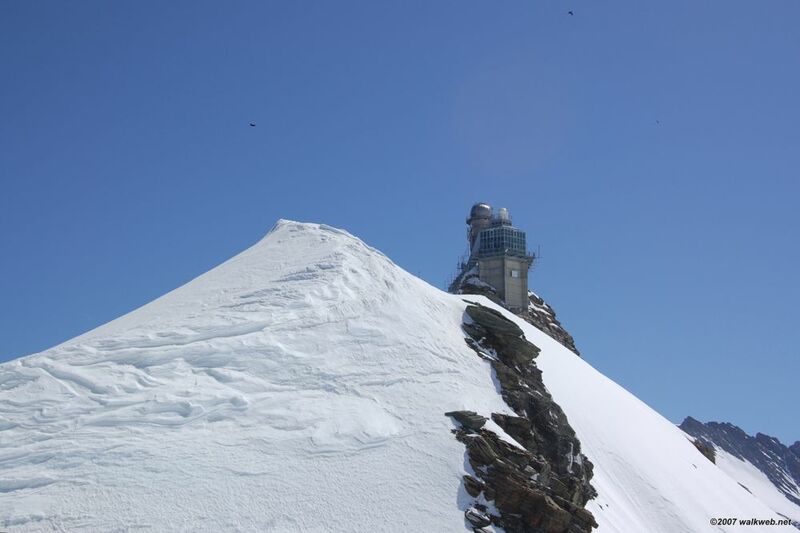 The trip to Jungfraujoch, while certainly a bit of a tourist trap, is nevertheless well worth doing. 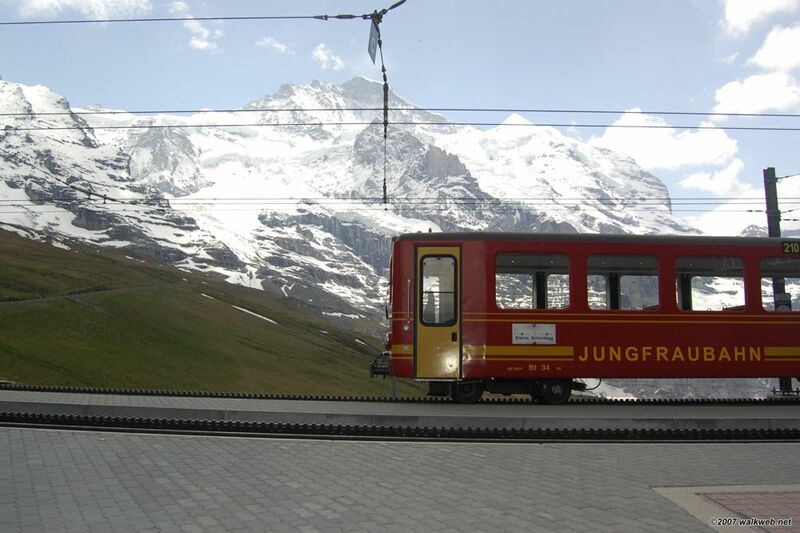 You travel by train from Kleine Scheidegg, climbing steeply before entering the Eiger itself, where the tunnel carves through to reach Jungfraujoch, between Monch and Jungfrau, at some 3454m elevation. The tunnel is an engineering marvel having been built long before modern tunneling machinery was available. The views from the observation tower are magnificent, and you can leave the tower for a short walk out on the mountain range itself. The complex also features an ice gallery which is worth a visit along with the usual souvenir shops and even on our visit an Indian restaurant (“Bollywood”). The walk follows a well made and flat path from Kleine Scheidegg to Mannlichen and provides excellent views of the impressive north face of the Eiger. From Kleine Scheidegg the path (no. 33 on the Jungfrau region hiking map – see note below) proceeds north-east, sidling around Tschuggen on the left and then curling northwards to reach Mannlichen. This part of the trail was very easy to follow with an excellent prepared path the whole way which was only occasionally obstructed with snow. 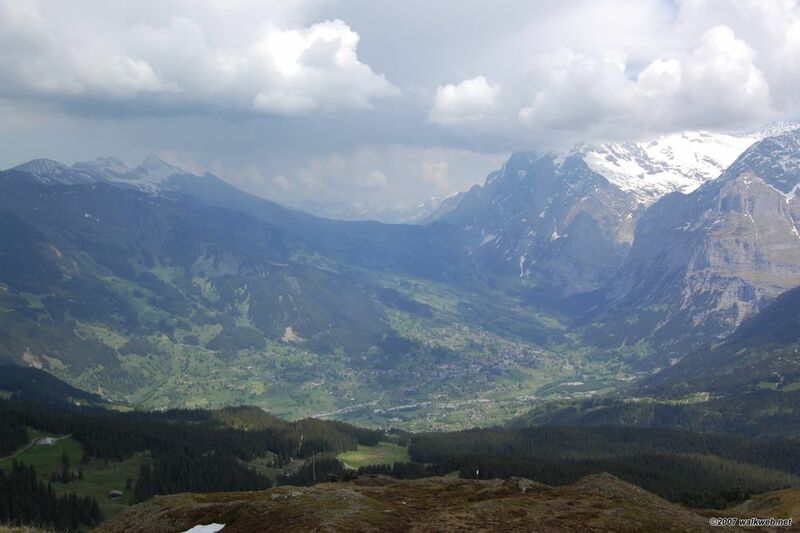 Views across to the Eiger and down into the Grindelwald valley are superb. This section of the walk is officially timed at 1’20” but took us only an hour or so. At Mannlichen you could take a cable car down to Grund in season (we were too early in the year and the cable car was closed), but a better option for walkers is to continue by foot. 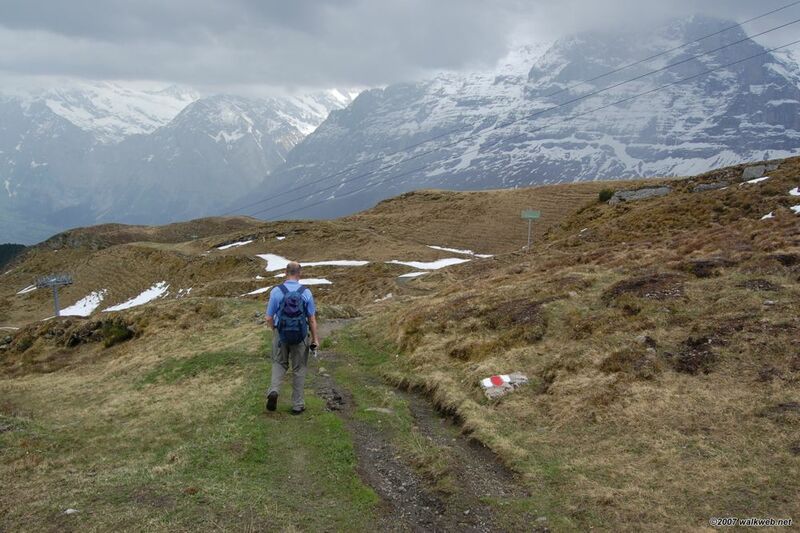 There are several possibilities; we chose to walk down to Alpiglen and then caught the train back to Grindelwald. This path (no. 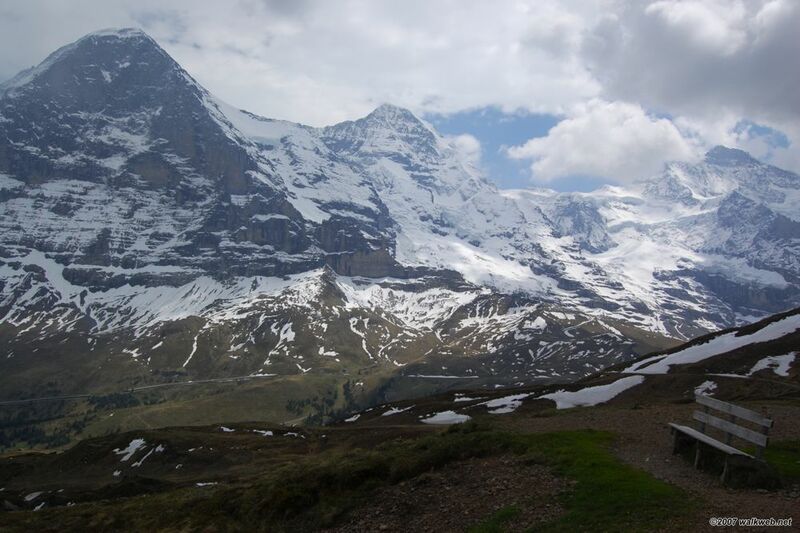 35) descends over a grassed area and then passes through a very attractive wooded section before continuing on a well made path that turns east to cross over the rail line below the Eiger’s north face. The path continues following the line on the south side before reaching Alpiglen station (you could continue to walk from here down into Grund if you were feeling energetic). This section took us a couple of hours, with a brief storm blowing over during the descent and adding a bit more interest. Definitely another A+ walk. All in all then, an excellent day, and I can recommend combining a visit to Jungfraujoch in the morning with a walk in the afternoon. 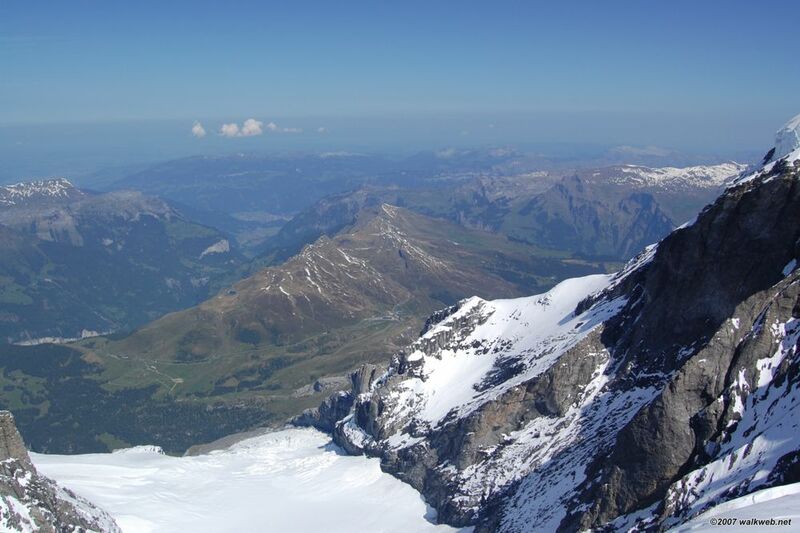 The Jungfrau region hiking map is available free of charge from train and cable car stations in the area. I haven’t been able to find an online version, so have scanned the relevant part for this walk, click here for the pdf.